Diet Consultation? 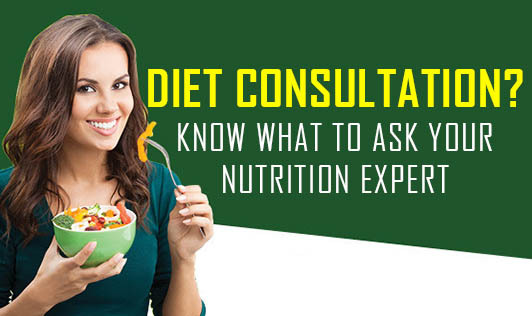 Know What to Ask Your Nutrition Expert! Most people think diet is all about following restricted eating habits and starving yourself. The term "diet" has undergone metamorphosis through the years and people do not like it much these days! But, the fact is that a diet is only a "healthy" way of eating what you have been eating so far. It incorporates certain aspects of health and is made to suit you best. If you have scheduled an appointment with a nutrition expert, make your appointment worthwhile by giving her the right details. Let me tell you something interesting! If you didn't know, the origin of all chronic diseases and ailments is due to the improper food we eat! It therefore, becomes important for you to share these details with your nutrition expert, so she can find the root cause to your problem and can guide you accordingly. It's simple! When you meet your doctor, don't you explain to him in detail your symptoms, pains and aches etc, to get the right medication and treatment? It's the same here. But, there is a small twist; your food is the medicine in this treatment. Yes, the daily food you eat that was the cause of your illness will now become your medicine; but the combinations are different and the varieties are more. It is no more of those bitter pills with any side effects! • Analyze your health goals. Eg: Weight loss, weight gain, Diabetes, Increased cholesterol levels, high or low blood pressure, Acidity, Constipation, Hyper or hypo thyroid, Pregnancy etc. • Give her time to plan a suitable diet as per your health goals and needs. • Understand what your dietician has to say about your diet. Do not ask about each and every food that is available in the market. When she says ‘you can eat all seasonal fruits and vegetables'- it doesn't make sense asking about potatoes and bananas. • Be specific with your question and clarify if you don't understand any of her points. Important of all: Once we get the diet chart, most of us just read it and forget about it, or, barely try one or two things out of it. This will definitely not give you the result you want. At the end of it, the complaint is "it is impractical to follow!" If a diet doesn't seem doable for you, ask for another one. She will be able to give you several ideas to incorporate healthy recipes into your meals. If there is something you are not comfortable with in your routine, try it for a couple of days and then talk to her about an alternative. At the end of the day, it is your responsibility to follow the diet and make it work best. We will be there to guide you through it. On counseling sessions, it is important to ask questions related to food and health. There are certain questions that only a doctor will be able to help you out with. Follow up with your dietitian regarding your diet prescription and weight tracking records. And, never forget to appreciate the hard work that you and your nutrition expert have put in to help you achieve your goal. As the famous saying goes "The natural healing force within each one of us is the greatest force in getting well. Our food should be our medicine. Our medicine should be our food"- Hippocrates.